Limberjacks are old and established traditional wooden “toys” for adults and children alike. Basically they are wooden dolls with loose limbs that step dance or “jig” on the end of a vibrating board or platform just like a step or clog dancer. Limberjacks have been popular for hundreds of years. In 18th century London they were frequently seen operated by street entertainers or buskers. Old soldiers sometimes performed with them to add to their military pensions. It has been recorded that limberjacks were first brought over to England from Italy by young itinerant musicians probably as early as the 1500s. 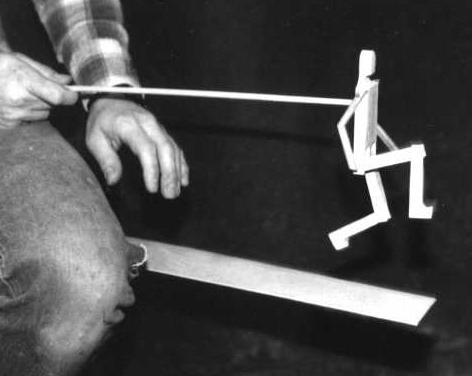 They were known as “Les Petites Marionettes.” These were dancing dolls or puppets operated by a horizontal string attached to the musician’s leg, which “danced” on a board as the musician tapped his foot. A wooden rod attached to the back was added later. 2. Slip about a fourth of the paddle under your right thigh. Most of the paddle will now be sticking out over the right side of the chair. If you’re left handed, reverse these directions. 3. Insert the dowel firmly into the hole in the back of the limberjack. 4. Grasp the end of the dowel in your right and rest the limberjack’s feet on the end of the paddle farthest from you. 5. With your left hand begin tapping the middle of the paddle. The limberjack will begin to dance. Experiment with how firmly or gently you tap. Don’t tap very hard and don’t make the limberjack dance by trying to move it with the hand that’s holding it. Just rest the limberjack on the paddle and let it dance. You can make the limberjack’s arms swing. Continue dancing the limberjack and, at the same time, rapidly move the hand that is holding the dowel forward and backward. Experiment to find a rhythm that will keep the arms going round and round. You can play the limberjack by itself of course, but it’s more fun to dance it to music. Lively, quick music works best. Whether you’re dancing to live or recorded music, simply tap the beat (or twice as fast as the beat) on the paddle. Your limberjack will dance in rhythm with the music. With a little help, even young children can make limberjacks dance. Just sit as you would if you were playing the limberjack, and have the child hold the limberjack with the dowel while you tap on the paddle. It’s especially important to tell children about not making the limberjack dance. Limberjacks can break if handled roughly. Chrisp, Peter. History of Toys and Games. Wayland Pub. Co. 1996. Ketchum, William C., Jr. Toys and Games. Washington, D.C.: Cooper-Hewitt Museum of the Smithsonian Institution, 1981. Miller, G. Wayne. Toy Wars; New York: Times Books, 1998. Spilhaus, Athelstan, and Kathleen Spilhaus. How Old Toys Work. New York: Crown Publishers, 1989. Dictionary of American History. 2003. Encyclopedia.com.